Are you familiar with the user experience quote, “User interface is like a joke. If you have to explain it, it’s not that good.”? While clever, that statement is far from true. User interfaces shouldn’t be complicated, but you can’t expect a new user to understand a new interface without any direction. Similarly, you can’t expect an existing user to understand an updated interface or a new feature without any direction. That’s where user onboarding flows come into play. Proper user onboarding leads to more money in the bank. It’s a familiar concept for most, yet user onboarding flows are often created during development and forgotten about. Onboarding flows deserve innovation, experimentation, and optimization, too. You might be surprised by the ROI. There are two different types of user onboarding flows: mobile and desktop. 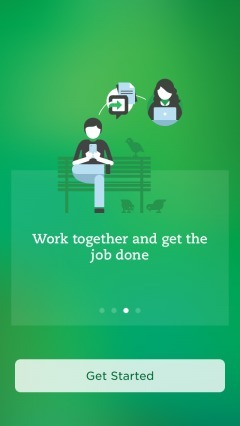 Mobile user onboarding flows introduce you to a game, a productivity app, a banking app, etc. Desktop user onboarding flows introduce you to a task management tool, a conversion research SaaS, etc. There are also different subtypes depending on how you are onboarded. Benefit-Focused: Explains the 2-3 core benefits and how to achieve that benefit via the site / product / app. Function-Focused: Explains the 2-3 core functions of the site / product / app and how to use them. 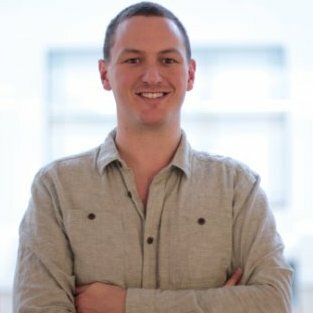 Doing-Focused: Walks the user through the first or most common actions. Account-Focused: Walks the user through the account / profile creation process, including finding and adding friends or interests. All: For particularly complex sites / products / apps, it may be necessary to combine the four above. The onboarding type is clearly dependent upon the medium, but the five subtypes are all viable options. It comes down to how much information your new users need to get to the core value, how easy it is to discover the core value organically and how “new” the core value is. Before: The sign up / registration phase. How friendly is your form? During: The initial user onboarding flow that most people consider “user onboarding”. After: All other stages of the customer lifecycle. How can you help existing users understand new features? Another common misconception is that onboarding email flows and on-site / in-app onboarding flows are to be kept separate. The two should complement one another, working together to bring the user to the core value as quickly as possible. On their own, they’re rarely successful. What’s the core value you’re trying to deliver to your users? What steps do new users need to take to receive that core value? What friction might exist within those steps? What actions do long-lasting users take? How can you encourage new users to take them? How familiar are your new users with similar products? How easy is it to understand your core benefits / functions? There is no “right” or “perfect” user onboarding flow. What works for one site / product / app might not work for another. In fact, that works for one of your users might not work for another. Designing a user onboarding flow that works for you is complicated. It involves a lot of research, testing and optimization. “User-centric, not product-centric: Onboarding tends to fall down when it’s just about the software pointing itself out. Action-oriented, not instructive: Rather than throwing up a bunch of tooltips that I have to remember later, have me learn by doing. Informed, not reactionary: Are the things you’re having me do highly correlated with me getting value out of the product, or are you just offloading busywork because your design is broken? Evolving, not fixed: Onboarding isn’t a “feature” but it’s often treated that way. Are you treating it like a quality of your overall experience that evolves along with your product and market, or is it something you ship every couple years? 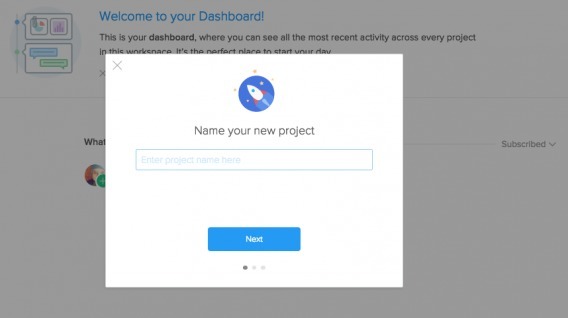 Why Are User Onboarding Flows Important? When I say “user onboarding”, you likely think of SaaS companies first, right? According to a 2014 State of SaaS report from Compass, SaaS is a $10B industry in North America. Yet 51% of SaaS startups surveyed were not profitable and only 33% of them expected profitability within the next 6 months. The same report found that less than 7% of SaaS companies achieve 10K users… ever. And only a little over 25% of SaaS companies with less than 10K users spend money on user acquisition. So, what does that mean? It means that user retention becomes even more important. If users are not onboarded properly, the chances of retention are minimal. If you weren’t originally thinking of a SaaS, you were probably thinking of a mobile app. But they’re not just browsing, they’re converting. For the leading 500 merchants, 42% of all mobile sales generated come from mobile apps. In fact, mobile app revenue for 2016 is estimated at $58 billion. So, all-in-all, mobile apps can be quite profitable, right? Right… if they’re used more than once. 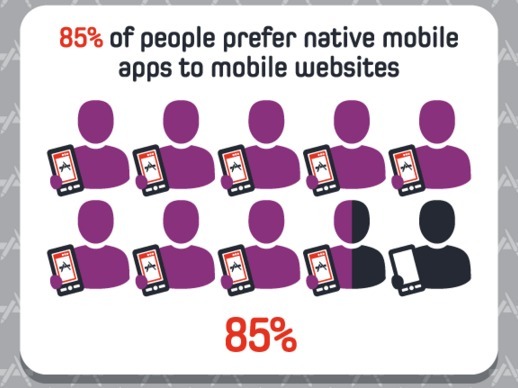 Unfortunately, 20% of mobile apps are not opened after that initial first visit. What makes an initial first visit memorable? And what makes a user come back again for more? A great user onboarding flow. 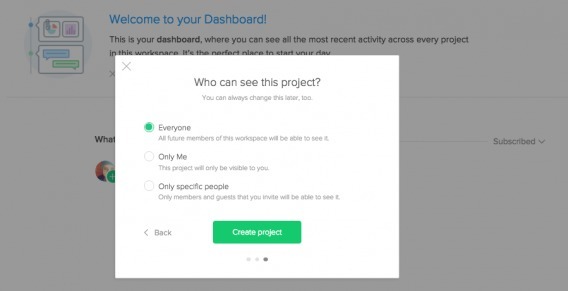 How Can You Set User Onboarding Goals? A trial-to-paid conversion rate or mobile user-to-customer conversion rate type metric is a good start. It’s close to the revenue, it’s measurable, it’s directly linked to onboarding. However, the true test of a user onboarding flow’s effectiveness is not whether there’s a conversion, it’s whether there’s retention. 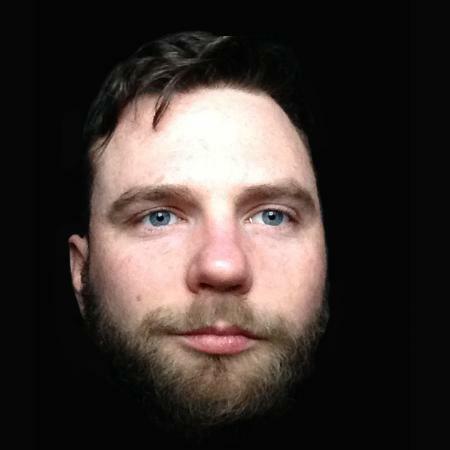 Samuel suggests asking yourself whether more people are continuing to log in for longer. If so, your user onboarding flow is successful (but you should continue optimizing). If not, you have some work to do. ROBIN is an all-in-one eCommerce customer service tool. All-in-one tools are an easy target for user onboarding flow analysis. Since they are typically complex products with many different functionalities, poor onboarding can be detrimental. From there, you’re actually taken into a mandatory wizard, which guides you through the process of setting up your live chat, integrating your email / social, creating customer service templates, etc. Note that in the welcome copy, they remind you why you want to use ROBIN in the first place. This is key for the users who would rather just get started right away. The stopwatch also subtly indicates that it will be a short process. Notice that as you move through the process, the navigation to the left becomes active. At this point, you can see that you are in the “Team” section and have five more sections to complete. In some cases, there are multiple steps within each section. For example, after completing the “Personal Information” step, you might’ve assumed you were finished with the “Team” section. It’s like a teacher assigning you questions 1-3, but each number also has an A-Z. Frustrating, right? Indicate progress as clearly as possible. Above, you’ll see another illustration. Note that these are provided at times of friction. For example, connecting your email and Twitter accounts to a tool you’re unfamiliar with could be seen as a security risk. Questions like, “Will it tweet on my behalf?” and “Will it send emails to my customers?” begin to arise. If something is not mandatory, don’t include it in a mandatory set up wizard. Instead, suggest it on-screen as the user progresses. There’s nothing wrong with asking for a lot of information… if it’s necessary to move the user closer to your core value. It would be helpful if the red dot within the message itself, which is the step we just walked through, turned green to indicate completion. It appears that this is the core function of ROBIN. Ensuring new users understand how to work this interface is paramount, then. Interestingly enough, you are not actually asked to take any of the actions described here, which seems like a logical next step for their onboarding flow. This user onboarding flow is clearly extensive. A full, mandatory wizard with multiple steps within multiple sections and a mandatory walk through. This raises an interesting question: How much is “too much” when it comes to onboarding? Inbound.org is self-described as “the internet’s smartest marketing community”. Everything Inbound marketing is discussed there. Needless to say, encouraging a new user to become an active, engaged member of a community is not an easy task. 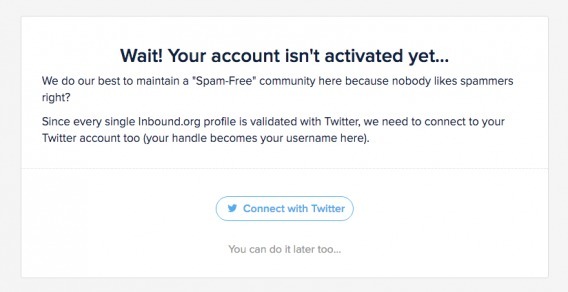 While requiring a Twitter account certainly would help prevent spam, it also makes it easier to grow the community. 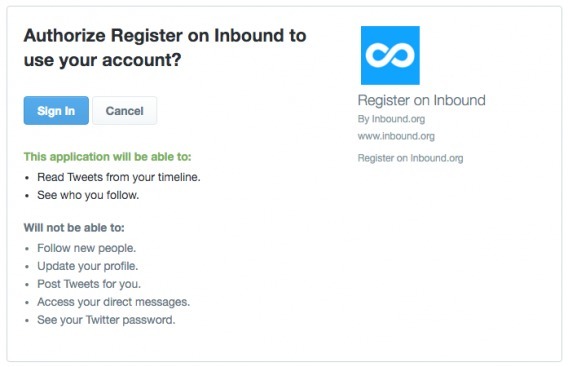 First of all, Inbound.org knows that many marketers, their target audience, use Twitter to network with their peers. So, the channel selection (vs. Facebook, for example) is strategic. Second, syncing with Twitter makes it easier to recognize friends, follow friends, invite friends, etc. “Their 2013 survey on The Value of Social Login says 92% of people have left a website instead of resetting or recovering login information, while 1/3 do so frequently. If your goal is any form of virality, social login is a must, as it increases your Monthly Unique Users (MUU) to Monthly Active Users (MAU), meaning a returning visitor is already in a position to take sharable actions. You’ll see that there are only a few fields and that “You can always add more details later.” This is a great demonstration of the “ask for only what you need” principle Samuel describes. However, what would be helpful is if Inbound.org were able to automatically pull in some information (e.g. location) from Twitter itself. You’re likely familiar with this type of onboarding tactic. If you use LinkedIn, you’ve experienced something similar. It’s a gradual onboarding process, which is a much different approach than ROBIN took in loading all of the onboarding upfront. Each step within “Getting Started” is a link, which takes you to the page that allows you to complete the step. 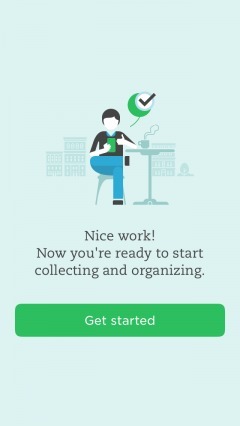 As you complete each, you receive a green check and your progress bar fills up. 1) They’re non-interruptive. I’m not at all a fan of throwing up a barrier to the user’s immediate progress in the form of a tooltip or splash screen, but progress trackers just sit there, helpfully abiding. 2) They’re persistent. Unlike other onboarding design patterns that only show up upon signup and are never seen again, these dudes hang around until the job is actually done. Onboarding doesn’t happen in a single visit, after all. 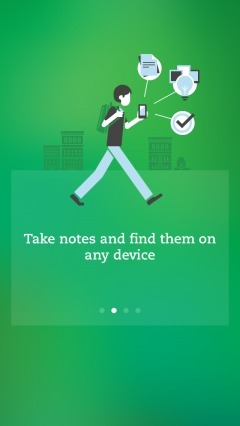 Evernote is a tool that allows you to write, collect information and present your ideas. It’s on your desktop and it’s a mobile app, but all of your files are available across all of your devices. Think Dropbox, for example. It pays to remind (or inform, in some cases) new users of your core value before the user onboarding flow truly begins. Why use this tool / site / app? What makes it different from the competition? How will it make your life better? Keep these reminders simple and brief. If you go too far, you’ll end up with frustrated users who just want to “get to it”. Creating a great user onboarding flow is a balancing act. How can you balance educating and equipping your new users with everything they need to get the most from your product with getting them to that core value as quickly as possible? You have to conduct research upfront. How well-informed are your new users on average? How familiar are they with similar products? How motivated are they to get started? The answers to these questions can help you decide whether to use these types of reminders, like Evernote and ROBIN, or skip them, like Inbound.org. Also, consider the environment. All that’s required to flip through these three pages on mobile is two swipes. That’s not exactly a barrier to entrance. Note that you can opt out of the tour. 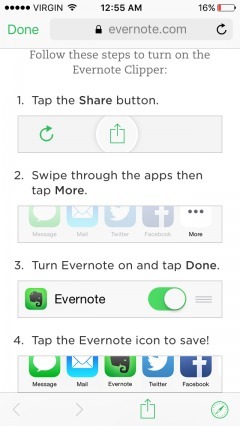 It’s a muted option to prevent new users from skipping it, but those who are familiar with Evernote (e.g. people who already have the desktop version) shouldn’t have a problem locating it. The progress indicator shows that you are on step “1 of 5”. To move on to the next step, an actual action is required… you must create a note. As you move through the tour, you asked to actually try the app. This helps the user get a real feel for the app vs. a theoretical one. Is it easy to use? Do you swipe or tap? According to research by William C. Bradford, approximately 65% of the population needs to see what they’re learning about to comprehend it. Another 5% needs to actually experience it. Plus, an action is a commitment. It’s the basic foot-in-the-door technique, right? Asking the user to take a small step, like creating a note or trying the camera, is a foot-in-the-door. Asking the user to let you in the door, now, will be easier. On mobile especially, it’s important to keep tutorials brief. New users don’t want to read through a manual or short eBook before using a core function. If it’s complicated enough to require a long, complex tutorial, it’s likely too complicated in general… and definitely too complicated to include in a guided tour. 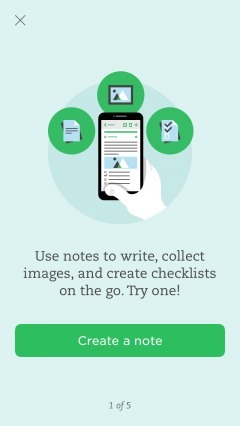 Evernote gets it just right with its four-step tutorial (with images). They have “Not now” options. 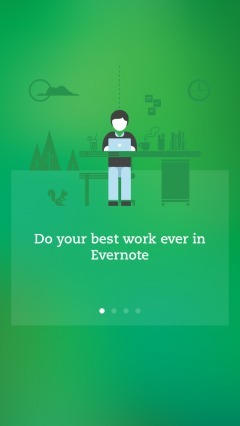 They are high-value for Evernote, but not absolutely required to move the user closer to the core value. 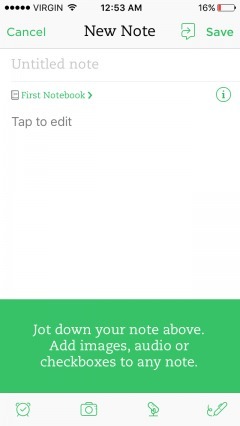 Of course it’d be beneficial for Evernote if you allowed mobile push notifications and downloaded the desktop version as well, but it’s a nice-to-have, not a requirement. 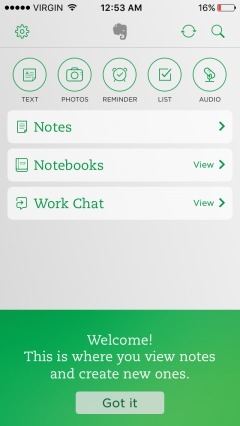 Note the differences between ROBIN and Evernote here. With ROBIN, you can either input 2-9 fields of data or select “I’ll do this later”. After a lengthy wizard, that “I’ll do this later” option becomes very appealing. 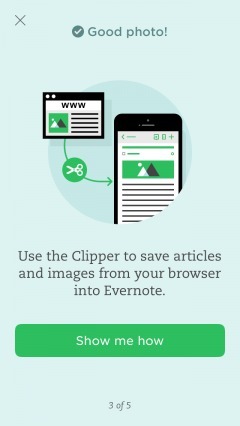 With Evernote, you can either click a button or a text-based link. Either way, the commitment and “physical work” is no more or less. 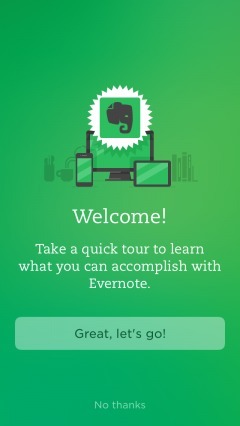 Also, ROBIN has many optional steps mixed in with mandatory steps, but Evernote saves two optional steps for the end. This prevents confusion and questions like “Why are there so many steps?”, “Why are so few mandatory?”, “Why do I need to do this now?”, etc. The final page is simple and to the point, but the call to action could be a bit more specific. What action should the user take next? What’s the best way for her to “Get started”? 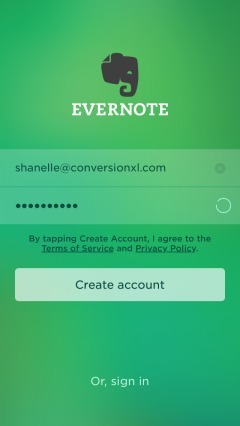 With a product like Evernote, it’s likely that users will move from mobile to desktop (and vice versa). Of course, the user experience (UX) will be slightly different depending on the device. An additional desktop onboarding flow is required, as well. See how each of the three functions I selected now appear as notes? 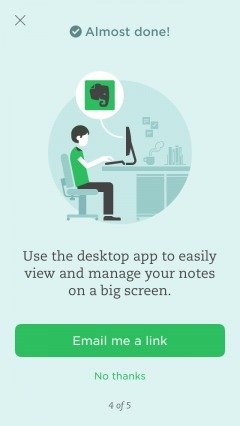 Evernote uses its own product to explain the product. That’s terrific user onboarding. 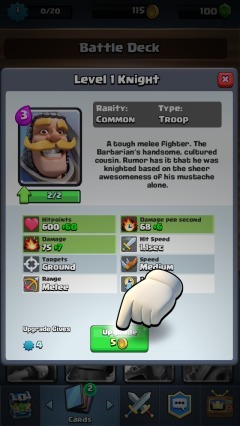 The team behind Clash of Clans has released a new mobile game, Clash Royale. 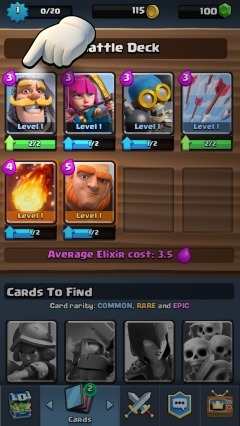 Similar in nature to the original, Clash Royale involves collecting and trading battle cards, battling online, joining battle clans, etc. 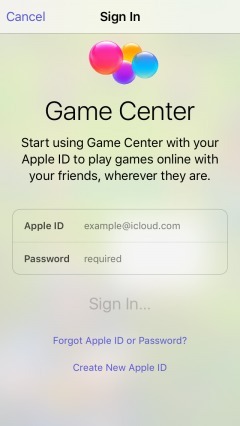 Asking new users to connect with Game Center is similar to asking them to connect with Facebook or Twitter. It makes it easier for them to find their friends, invite their friends, share their achievements with friends, etc. 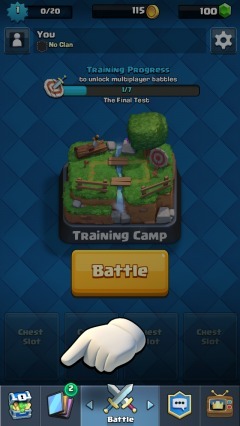 Instead of one simulated training battle, Clash Royale prompts you to complete a full series of training battles. Nearly the entire game is focused on the battle function, so it’s important that new users become familiar with the interface. They might not notice and comprehend all of the options the first time around. 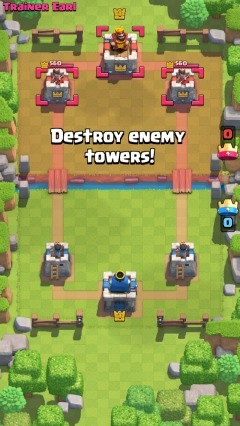 For example, I didn’t realize until battle three that you have to place your battle cards on your side of the bridge until you destroy a tower. With strategy games like this, especially where you graduate to playing against other people, a strong understanding of core functionalities is clutch. If someone doesn’t understand the concept, they can’t begin to develop strategy. Thus, they will lose. Who wants to play a game they lose 90% of the time? Few people. 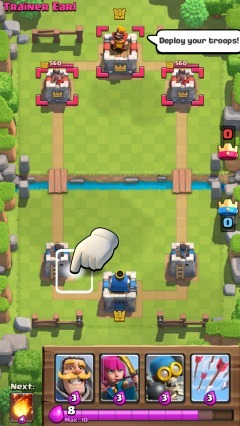 Note how the hand icon shows you where you can place your troops. 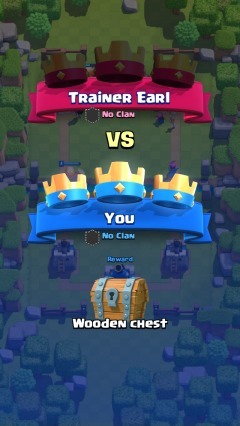 For my first couple of battles, I thought I had to place my cards all the way back at my tower. Instead, it would’ve been helpful if they had highlighted the eligible drop area, similar to how they highlighted the enemy’s side of the bridge. Chests are another core function of the game. You collect chests, which take upwards of three hours to unlock. You can pay with in-app currency (which is limited, but available for purchase with actual currency) to open the chests earlier, though. Inside the chests are new cards, gold, gems, etc. According to Localytics, 52% of people opt-in to receive push notifications when they download an app. Android users are more willing at 59% than iPhone users (46%), but that likely has something to do with Android enabling push notifications by default. The direct open rate for segmented push notifications is 7%. 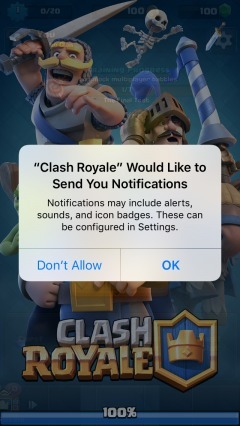 The number of people who open the app after seeing a notification is likely higher, but that’s the percent who open it via the notification. For example, I never actually open an app through a push notification. I read it, unlock my phone and navigate to the app myself. 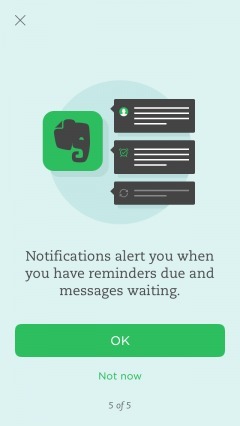 But how often do users take the action the push notification prompts them to? 54% of users who click on a segmented push notification convert. It’s definitely worth prompting your users to enable push notifications. 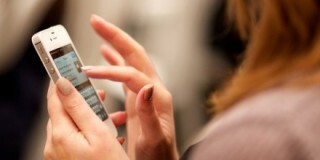 Re-engagement messaging is stronger via their personal mobile devices than email. You can see here that there’s a training progress bar. To move out of the Training Camp, you’ll need to complete another six battles against the computer. But first, you’re asked to tap the chest to unlock it. 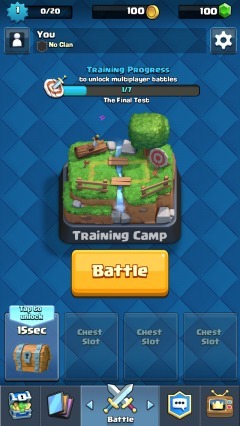 Note that while it takes hours to unlock chests, it takes 15 seconds in the Training Camp arena. 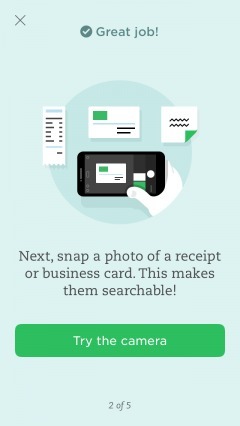 See how you can see “Cards to Find” below? That’s an important element of the interface. You can even read about the cards you have yet to discover. It creates a “I’ve got to get them all” mentality, which encourages engagement and habit formation. 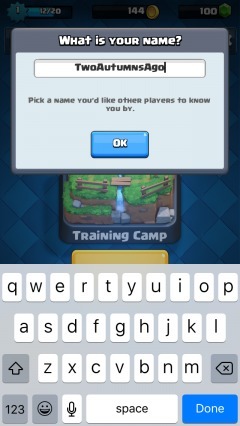 Asking new users to select a username this early is a great idea. It’s a type of commitment and it makes the game experience feel more personal. More importantly, it’s another sign of progress. 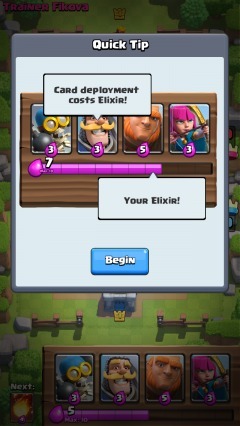 Given Clash Royale forces you to go through seven training battles, which seems excessive after you’ve gotten the hang of the interface, signs of progress are important. The question becomes: How much training does a user need before graduating out of the initial onboarding flow? While it’s easy to simply say “seven battles”, it’s more effective to decide case-by-case. 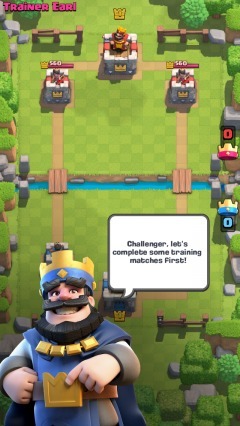 For example, if a new user wins two consecutive training battles by capturing all three castles and allowing the enemy to capture none within the first 90 seconds, it’s a sign that they’re ready to graduate. Instead of pushing them through another five battles, allow them to move on. Every user has different onboarding needs, so constructing a one-size-fits-all flow is not advantageous. 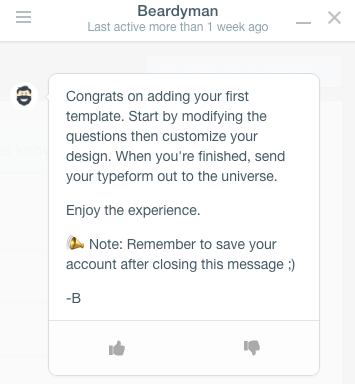 Flow is a task management tool for teams, which includes a built-in custom chat feature. This is key for Flow. 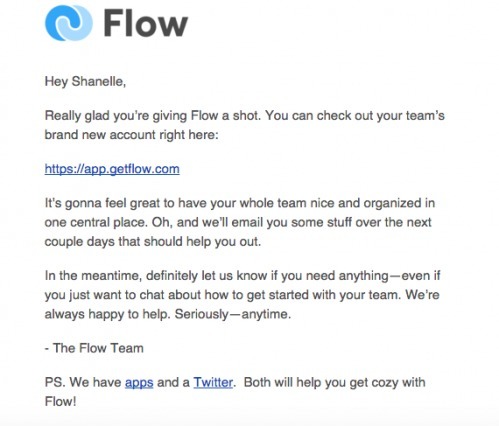 For Flow, it’s ideal if an entire team creates an account and begins using the software. A single user, I suspect, is much less valuable and less likely to stick around. Asking about the user’s company and team size upfront allows Flow to understand the growth potential from this individual user. You now have three options: invite your co-workers via email right away, send them a link or start using Flow without inviting anyone. Now, there is a welcome message and three different call-outs on the screen. One, of course, being the call to invite my team. Would this be here if I had invited 10-19 people in the previous step? I hope not. 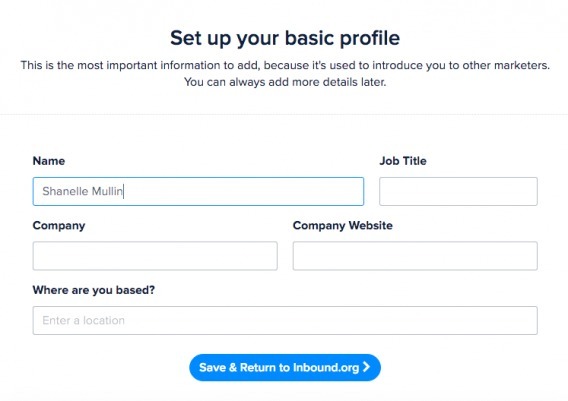 Whenever possible, personalize the user onboarding flow. If a step has been completed, don’t divide focus even more by prompting them to complete it again. It’s a simple reminder that a customer support team is available to assist you and instructions for how to contact them. Task management systems can be complicated, especially when you have to onboard an entire team. This gentle reminder is likely very necessary. Another key action for Flow is creating a project. The sooner a new user creates a project, the sooner they can understand the benefits Flow has communicated to them. I’m willing to bet “adds a teammate” and “creates a new project” are two KPIs for Flow. Since this is a core functionality, it’s important that new users understand it fully. If the user is the type to follow instructions, she might want to watch the demo. If she is the type to simply dive in and try it, she can skip the video and do just that. This self-guided tour allows users to choose the onboarding flow that they want, but not necessarily the one that they need. That’s the balancing act. If they don’t watch the video, they may not understand how the process works. Worse, they might miss features. Three simple steps and you’re done. One thing Flow has nailed is efficiency. They don’t ask for more information than they need and they simplify steps to create the least amount of work possible for the user. While it’s not part of the initial three-step user onboarding flow, there are more onboarding tactics at play here. Remember, user onboarding does not end after the initial “welcome”. It’s an on-going effort to keep new users engaged and coming back for more. You’re welcomed and prompted to send your first message to the group. After doing so, you’re shown a congratulatory message and, again, prompted to invite your team to the software. After all, if you’re exploring the chat function, you likely have a team you’d like to communicate with. Notice how, yet again, you are pushed to think about inviting your team (“It’s gonna feel great to have your whole team nice and organized in one central place.”) This is an example of how email and on-site onboarding flows can work together. It’s too soon to tell, but hopefully if you have not added a teammate or created a project within 24 hours, you receive another email prompting you to do so. Typeform is a modern form creation tool used to ask for insight and payment. It’s often used to manage incoming job applications, suggestions, surveys, polls, registrations, orders, donations, quizzes, etc. If you’re familiar with Typeform, you’ll recognize this as the “My workspace” interface, which is where all of your forms are stored when you have an account. It looks and feels just like you have an account of your own, despite the fact that you have not actually created an account. Beardyman explains the next steps and also reminds you to save you account before leaving. Remember, you have not actually created one yet. If you look back at the images above, you’ll notice that there’s a “Save account” button in the top, right-hand corner of the screen. There’s Beardyman again, explaining why you would want to save your account. The use of the word “save” is interesting. You’re not “creating” something new, you’re “saving” what you already have. If you enjoyed the form creation process, there’s very little reason not to “save” your account. 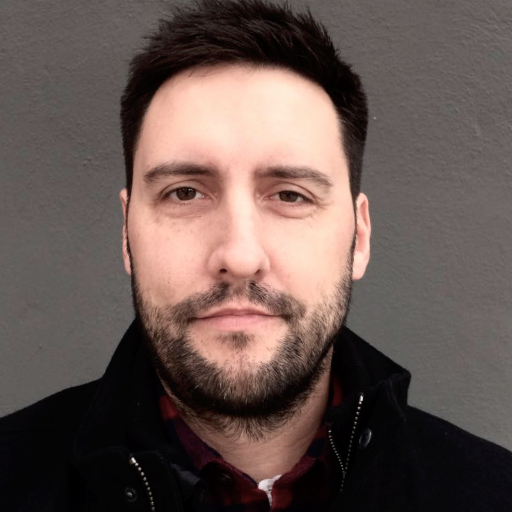 Typeform focuses on getting new users to the core value as quickly as possible by simply allowing them to use the product right away… even without creating an account. This isn’t a user onboarding flow that you see every day, but perhaps it should be. Expecting a new user to know how to navigate and get the most from your interface is like expecting a toddler to cook you a five course meal. It’s just not going to happen. The least you can do is create an initial user onboarding flow to help him get acquainted with the interface. However, your job doesn’t end there because user onboarding isn’t about simply familiarizing new users with your interface. It’s about getting them into a habit loop and ensuring they come back again and again. Focus on all stages of onboarding. 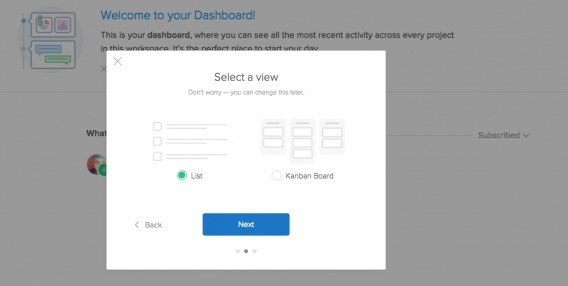 Existing users need onboarding flows for new features, inactive users need an onboarding flow, new users need an onboarding flow that extends beyond the first five minutes of registration. Combine email and on-site user onboarding flows for the best results. The two should work together and complement one another, always pushing users towards experiencing the core value. Choose an onboarding flow that’s right for your audience. It depends on their familiarity with your product / industry, their motivation level, the complexity of your product, etc. Experiment and optimize based on your findings. Choose a metric like trial-to-paid conversion or seven friends in ten days. What can you do to encourage that behavior? 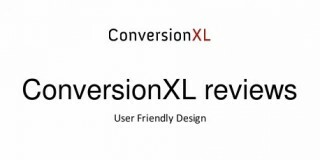 It’s just like any other element of CRO… start with conversion research. What behaviors did your long-lasting users display early on? What trends can you identify? User interface is quite a complicated issue for me. But anyway, you just done a complete research. Btw, how can you do it so often? Do you ever sleep? I’m glad you liked the article. Which onboarding flow did you think was the most effective? Onboarding users correctly is not an easy task. I work for a SaaS and we are still trying to figure out the best way to do that. Articles like this are extremely helpful! Anyways, lately I’ve been thinking that sometimes onboarding can “fail” (meaning: doesn’t seem to be working) because the company is not attracting the right leads in the first place! And I don’t know the best way to handle this yet. If I’m attracting the wrong leads, I’ll never know how effective my onboarding is. Because I’m testing it against people that might not be the ones that will see the value of our product. What are the “wrong leads” who signup looking for? They must see some sort of value, unless your proposition is unclear. What percent of your total new users fall into this “wrong leads” category? Is it possible that they’re the right leads? Try looking back at the tasks / actions your most valuable users took within the first 24-48 hours. Then the first week. That’s the best way, in my opinion, to craft an effective onboarding flow. Great read! Something I really resonate with, and there’s a bunch of solid points written here. Thanks John! Glad you liked the article. Great article. I am just launching my first startup and I totally missed the boat on onboarding and retention. Spent all my time (and money :)) focusing on the platform itself that I am only now realizing how much this process is lacking. Your article was a real eye opener and I will be implementing many of your suggestions. Hey Jacob! Thanks for reading and for the kind words. Glad the article helped.